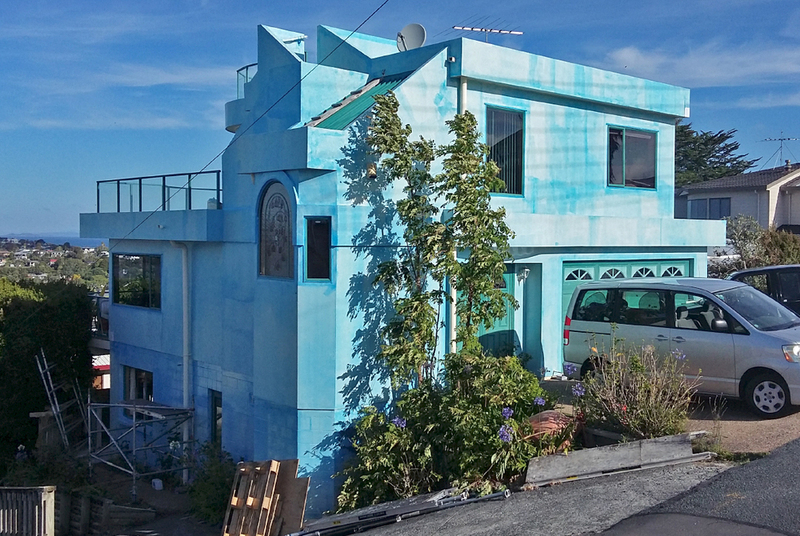 Our Liquid Blue Skin (LBS) is a specialised coating for cladding monolithic houses and concrete or block walls. The cladding uses a base layer of Blue Barrier, a link coat which allows the final top coat of hi-build paint to attach. This makes the liquid cladding system a three-layer system that breathes. What does our Viano LIQUID BLUE SKIn cost? Our liquid moisture proofing system is extremely cost-effective, as it works out between 10-20% of a total reclad, or about twice the cost of painting your home. Blue Barrier is a liquid membrane that replaces building wrap or underlay. It is directly fixed to RAB board or any of the construction boards available on the market. There are joint fillers, liquid wrap and 'flash n wrap' which are designed to waterproof the building before it has been clad. Our FFR K1 membrane coating is a Kevlar-infused liquid membrane combined with a reinforcing scrim to create the best performing membrane in the industry. After the Viano waterproof liquid cladding system has been applied to the dwelling, the home is now provided with a performance warranty. The warranty runs for 10 years after the application of the liquid cladding system, and can be extended, providing the house is annually soft washed, and repainted between years 8 to 10. The warranty is transferable to any new owners of the home, at no cost. Exclusions are: a) Vandalism, b) "Acts of God", c) Failure of roof, decks or joinery, not fixed or installed by Viano Coatings Ltd.
Enquire now about protecting your valuable home from moisture damage with Viano specialised coating systems!